We can also provide photos and/or video for your media needs. The New York Times – “Making the Dream Trip a Reality” – Sunday Travel section article about the Meet, Plan, Go! events and our career break movement. Everyone interviewed was involved with Meet, Plan, Go! 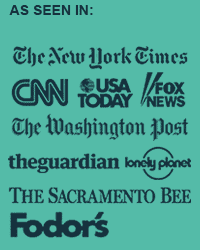 USA Today – Promoting our Inaugural year of events and online course. Forbes – Michaela Potter is interviewed in this piece about how to take a sabbatical from work. KPAM Radio (Portland Oregon) – Interview with Michaela Potter about traveling career breaks and international volunteering. Indie Travel Podcast – Interview with Sherry Ott about her around-the-world solo travels and returning home after 16-months on the road. Uptake Travel Industry Blog – Highlighting Briefcase to Backpack’s efforts to make career breaks part of the American culture. Escape from Corporate America – Daring tale of Sherry Ott’s escape from corporate America and transition to world traveler and expat. Transitions Abroad – Sherry Ott is included in a round-up of long-term travelers. Wandering Educators – Sherry Ott is featured twice: Following her travel dreams by leaving the world of corporate and as their photographer of the month. Indie Travel Podcast – We produced and edited this overview on Briefcase to Backpack, including the inspiration and mission of the site. Indie Travel Podcast – Sherry Ott is also a featured writer and content provider for this website.